What does the updated Canada's Food Guide mean for farmers? Say goodbye to the four food groups; they are now gone. Almost 12 years after the launch of the previous version, the new food guide celebrates food by displaying a plate filled with greens, fruits, plant proteins and grains. And if you look very carefully, you’ll see a cup of yogurt, alongside a piece of beef that looks a little like a piece of wood. Unlike the old version, the new guide can apply to different demographic groups and lifestyles. Somewhat less innovative, it also encourages Canadians to cook, eat with other people, and consider water as their drink of choice. 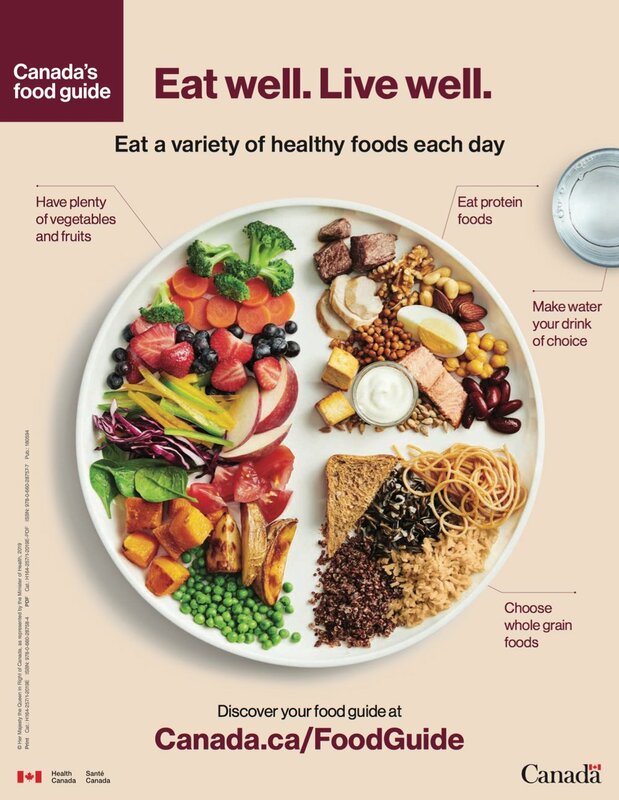 The new food guide is a bold move from Health Canada, but still contains some hits and misses. Historically, the guide has showcased our agricultural know-how, beginning with its first edition released in 1942. At that time, not only did almost 30 per cent of our population live on farms, but nearly 30 per cent of our national GDP came from agriculture. It was expected that the government promote commodities grown in our own backyard. The guide displayed products we all knew: milk, fish, and meat. Now, less than two per cent of Canadians live on farms, and agriculture represents a fraction of our national GDP, compared to that of 1942. The tone of this new guide is different as well, as it embraces a different language: the nutrient-focused jargon Health Canada believes Canadians are ready for. Fibre and proteins are now at the core of this new publication. In other words, the guide has gone urban for the first time in its history. There are some weak points in this new guide, though. Some of it is actually quite condescending, with trite advice only an idealistic health professional would give. “Enjoy your food,” or, “Be mindful of eating habits,” or the patronizing, “Be aware of food marketing,” are displayed prominently in the new guide. As the food guide became more sophisticated with what we should be eating, it also got a little smug on the behavioural aspects of our diet. The insensibility of treating Canadians like five-year-old children is very obvious. Since the food industry spends billions on marketing and the average Canadian will see roughly 1,500 advertisements per day, Health Canada seems to suggest Canadians can hide from all of this for the sake of eating better. A bit of a stretch on Health Canada’s part. Our agricultural trade policies are currently not synchronized with our own domestic food policies, and this new guide will only make things worse. Ottawa cannot carry on stating it unconditionally supports our supply management policy. It clearly doesn’t, at least not anymore. On the fruit and vegetable front, things can get tricky as well. Our food market is highly vulnerable due to our dependency on imported fruits and vegetables, especially during the wintertime. Fruits and vegetables are the most volatile food category we deal with as consumers. As an example, lettuce prices went up by a whopping 39.4 per cent over 12 months in Canada. For us mere mortals, these price shifts are hard to cope with. We will need to think of ways to raise our veggie game in Canada, and fast.